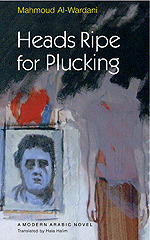 Heads Ripe for Plucking "Hard Cover"
An Arab tyrant once infamously declared, “I see heads that are ripe for plucking.” In Mahmoud Al-Wardani’s novel of tyranny and oppression, an impaled head seeks solace in narrating similar woes it sustained in previous incarnations. Beheadings, both literal and metaphorical—torture, murder, decapitation, brainwashing, losing one’s head—are the subject of the six stories that unfold. The narrative takes us from the most archetypal beheading in Arabo-Islamic history, that of al-Husayn, the grandson of the Prophet Muhammad, via a crime passionel, the torture of Communists in Nasser’s prisons, the meanderings of a Cairene teenager unwittingly caught in the bread riots of 1977, a body dismembered in the 1991 Gulf War, and a bloodless beheading on the eve of the new millennium, into a dystopic future where heads are periodically severed to undergo maintenance and downloading of programs.